Ill see about adding that to the 2.0 release. FTBIslands made this same mistake and it's catastrophic and kills late game servers if left unchecked. SAVE ISLANDS.JSON ALONG WITH THE WORLD! 2. If the world gets corrupted and you have to backdate the world then anyone who created islands after the backdated point will not be able to easily create an island to start on. We're talking about modded minecraft here, it breaks all the damned time in weird ways. It will happen at some point. Please, in the next update on world load check if world/data/islands.json exists, if it doesn't but config/islands.json exists copy migrate the island json. I have a version ready to be put out right now I have the island.json backed up into the worlds folder in <world>/island.json the one config folder will be used for the next few versions(likely two) then I will switch them. Ill be dropping the release later today. Thank you very much for a nice mod, man! Finally we have a configurable gap between the skyblock islands! Can't wait for you to update the gen algorithm to work on two axes, not just x, do you possibly have some timescale for that? I'd very much like the server to have a cluster of platforms which are expanding from the center space, not a long line of increasing x coordinate like now. Another nice to have thing would be a random side placement of a new island — not only by increasing the axis value by the set increment, but making a random step from the last known site. Green squares are the initial tree positions (that's why I'm asking for the exact starting position below), numbers nearby are the generation sequence, grid is chunk-sized and colored overlays are the player lots. So the idea is to have like a "space station" where each player has her narrow lot which can be expanded on both Y dimensions in the simpler setup and on one dimension (from the center) — in another. All the initial trees/platforms will be in time interconnected by a set of passages built by players. Could you please also let me know if there's a way to place starting on precise coordinates I need? Deleting world folder and modifying level.json down't seem to have any effect on initial placement. Ok I see where your coming from the time frame to the Y cords is whenever I get time after work :P .
The Spawn Island Location is based off of the world spawn I don't even have control over that yunomakegoodmap makes that first island I just add the spawn location to the island.json. What you could do is use yunomakegood map to make the new spawn island and then use the setspawn command to make that default island and add that to the island.json file. I'll add command to make a new spawn island in Y cord update. OK, thanks, cool! What do you think about randomly creating new islands on both plus and minus x, will you add it also? Could you please elaborate on what exactly do you suggest with yunomakegoodmap? I don't seem to find any commands on that mod. 1. I deleted island json from both locations (/config and /world) and got rid of the existing /world, then I restart the server. 2. I set spawnpoint where I need it: "/setworldspawn -24 69 24"
3. I created default tree platform with "/platform spawn yunomakegoodmap:TREE none -24 69 24"
4. 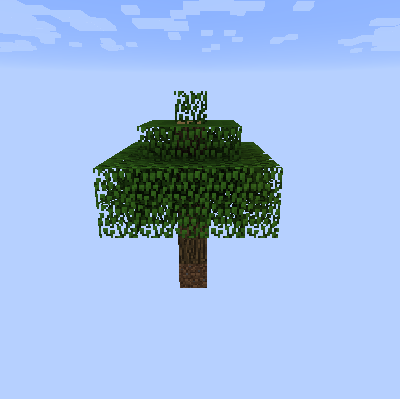 ItsBecauseUHasNoGoodSpawn config is set to spawn new trees in some small interval (48 blocks) when the user is connected for the first time. So i'm wondering why this mod isn't server-sided only ? There are some client side features that have yet to be added. I still need to get some of the back end features added first though(Team islands, arbitrarily named islands, Island teleport signs). Then I want to work on an GUI to show the island list and a teleport option from that. Does the mod has to be clientside? How far out on X does it go before it creates a new row on the Z? In theory till the block limit. I can add a Max config option to create a new row on the Z I can see how that could be useful. AND you can't tie the commands to a command block, so I guess we have to stay in the server 24/7 so every time someone new comes on we can run the command for them? That's odd it worked on our test server I'll have a fix/look when I get home from the holidays, currently I don't have access to my work computer.